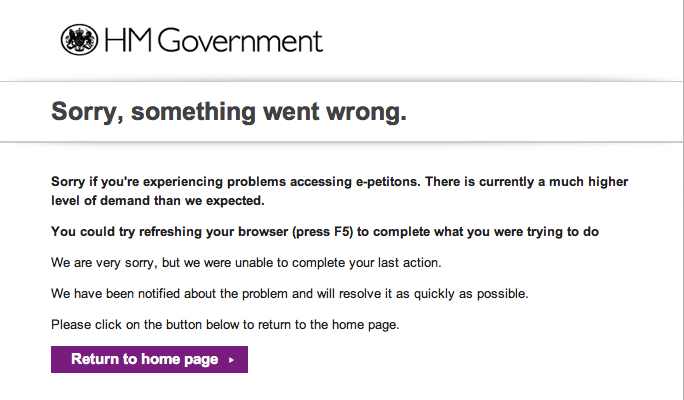 The Government e-Petition site celebrated its first birthday last month, and the team at the Government Digital Services released figures about usage in its first year. 15,600 petition were opened, but a massive 47% of petitions submitted were rejected. 6.4 million signatures were collected from the 13 million unique visitors to the site. Only 10 petitions reached the 100,000 target that allows them to be discussed in Parliament, and all have been or are due to be debated by members of the House of Commons. 97.7% of e-petitions receive less than 1,000 signatures. I had mixed feelings when the site was launched a year ago, so a year on has the site proven to be a good addition to the campaigning landscape? It’s got people signing petitions – I’ve not been able to find any figures for the number of individuals who’ve signed a petition and I suspect some significant duplication, but even with that included getting millions of people used to taking action has got to be a good thing. If you’ve signed a petition here, I think it makes you much more likely to sign a petition sent to you from 38 Degrees or others. Anecdotally I’ve seen a number of the petitions shared on my social media channels beyond those who normally express an interest in campaigning. It’s provided a clear outcome to those petitions that reach their target. Their was some concern at the launch of the site, that Parliament wouldn’t have time to debate all the petitions that reached the 100,000 signature target, but until the recent rejection of the petition launched by Virgin Trains against the loss the franchise to run the West Coast mainline, it has. Whatever you think about the topics that have been debated as a result, its good that they’ve been debated by Parliament, and in the case of the petition to get ‘full disclosure of all government documents relating to 1989 Hillsborough disaster’ helped to push an important issue that had been largely forgotten by much of the media back into the public consciousness. However as the Hansard Society point out ‘the system is controlled by government but the onus to respond is largely placed on the House of Commons’ and many people might be disappointed to learn that the majority of petitions are debated in Westminster Hall, where votes cannot take place and are therefore held on non-votable ‘take note’ motions. As the case of the Virgin Train petition shows, it’s an especially ineffective tool when Parliament isn’t sitting and a petition responding to a current issue gains traction quickly. It’s disempowering for the majority who have signed a petition. A handful of petitions have been debated, but many more have fallen short. At present there are 12 petitions with between 30,000 – 80,000 signatures on them, perhaps a few of them will make the 100,000 target but most won’t. My Campaigns Totals research has shown that 50,000 actions is a significant number, but the e-Petition site doesn’t provide those who create the petition with many tools to keep those interested in the topic engaged. They get to send an email at the close but that’s it. I’m concerned that for most they sign a petition hopeful that it’ll actually change something, but that when that doesn’t happen they’ll start to question if other forms of campaigning actually work. As the Hansard Society point out ‘if an e-petition does not achieve the signature threshold but still attracts considerable support (e.g. 99,999 signatures) there is no guarantee of any kind of response at all’. The rigidity of the system means that many are going to be disappointed. Most campaigning NGOs haven’t launched petitions on the platform, looking through the petitions that have reached the 100,000 target they’ve appeared to have provided an opportunity for individuals or very small campaigns with fewer resources to generate support for their issue . This has often come on the back of an effective social media campaign but the number of ‘failed’ petitions should add a note of caution that this is a high-risk strategy for organisations with limited resources. Other successful petitions have been those backed by media organisations, for example the ‘Make financial education a compulsory part of the school curriculum’16 was backed by Money Mail, a sister paper of the Daily Mail, and the ‘No to 70 million’ petition on immigration has been heavily mentioned in some parts of the media. The creation of a Petitions Committee with staff which would tasked with sifting petitions that secure lower levels of support to ensure that, where appropriate, relevant petitions are, for example, still tagged to debates, that MPs are made aware of their existence, and petitioners receive some form of feedback. The Petitions Committee and its staff should respond ambitiously and flexibly to petitions, embracing the full range of parliamentary processes for consideration of them. Using petitioner postcode registration data to develop heat maps on the website to help MPs and others identify issues of specific concern to a community. I’d also suggest that while the site has seen some innovation to it since it was launched, for example the inclusion of a ‘trending petitions’ section on the homepage to help you identify those that have been most active in the last hour, lots of other changes that were suggested at the launch haven’t been included which would help to make the site more engaging for petitioner to use. Finally, I think as a sector we need to be doing more to help provide those looking to take action with information on if this is the most effective tool to use, this is in part being done by organisations like Change.org and 38 Degrees who allow people to create their own petitions, but others can do more to help inform these decisions and support the many campaigns that don’t actually need 100,000 signatures to deliver change. The Guardian had an interview with Dame Fiona Reynolds, the Director General of the National Trust on Saturday, where it asks if she is the most powerful woman in Britain at the moment based on the way that the organisation is currently campaigning against reforms to planning laws that threaten the countryside. The National Trust has over 4 millions members in the UK. While, we don’t have a way of systematically ranking organisations based on influence, I think that the National Trust could make a genuine claim to be one of the most influential campaigning organisations in the country at the moment. Here’s why. 1. Membership – The National Trust announced earlier in the month that their paid membership is now over 4 million, that’s around 1 in every 10 voters. I’d suggest that many of these members are based in marginal constituencies around the country, as well as in safe Conservative areas, for example Surrey is the county with the most members. That means its members views are likely to be heard by lots of Tory MPs. Moreover, I’m sure that many MPs, Lords and other key influencers are also members, and share a natural affinity with the organisations aims. Their reach is simply put enormous, with a membership far bigger than any single political party or trade union in the UK. Moreover, I suspect many members of the National Trust wouldn’t see themselves as the ‘campaigning types’ so the organisation has an opportunity to introduce campaigning to a whole new audience. 2. Influence – As Dame Reynolds says in her interview, the National Trust doesn’t want to be ‘became rentaquote, that wouldn’t be right. We reserve our voice for something that is really important, absolutely at the heart of our core purpose and touches what we stand for and where we make a difference’. As such I’m sure when the National Trust chooses to campaign on an issue I’m sure it send panic through the heart of the government. They’ve proven they can mobilise hundreds of thousands of people to take action, most recently collecting 200,000 actions on a petition around the changes to planning legislation, and a look at the Guardian data on ministerial meetings suggest that the National Trust has met with ministers from across Whitehall. But equally they’re smart about selecting issues that they campaign on, with Dame Reynolds saying they’d only work on issues that are ‘central to what we do and I suspect it would be rare, but when we make a contribution it matters’. Their influence meant that when they speak up those at the top of Government need to act, for example the Prime Minister recently writing to say ‘we should cherish and protect it [the countryside] for everyone’s benefit‘ in response to the Trusts most recent campaign. 3. Communications Reach – The organisations magazine has the 6th biggest magazine circulation in the UK, and is estimated to reach over 3.75 million people, which provides a great platform to inform and mobilise individuals to take action, imagine inserting a campaign postcard into every one that gets mailed. While their social media penetration is also impressive, the recent Charity Social 100 Index put them at number 7 and they have over 40,000 followers on twitter. All add up to a significant base from which they can mobilise. Do you agree? What criteria would you use to identify the most ‘influential’ charity? The process for setting up an e-petition on the new website is simple. Here is a step by step guide adapted from the Governments website. 1. Submit – The title can be up to 150 characters (although if you want to tweet it you’ll want it be shorter) with the petition itself up to 1000 characters. When you write it consider the criteria that it’ll be judged against, including the need for a request for action. You also need to specify the department responsible for the issue your petition is on and the length of time you’d like the petition to run for (3, 6, 9 or 12 months). On the next page you’ll need to submit your details (name, address, email) which appear to require an individual rather than an organisation to create it. 3. Get signatures – You’ll need to get 100,000 signatures for the petition to be ‘considered’ for debate in Parliament. The petition will be hosted on the e-petition site and submissions can only be made through the site (although a URL will be provided to promote it on social networking sites). Anyone who signs will need to provide their name, address and email but these won’t be visible to anyone else. 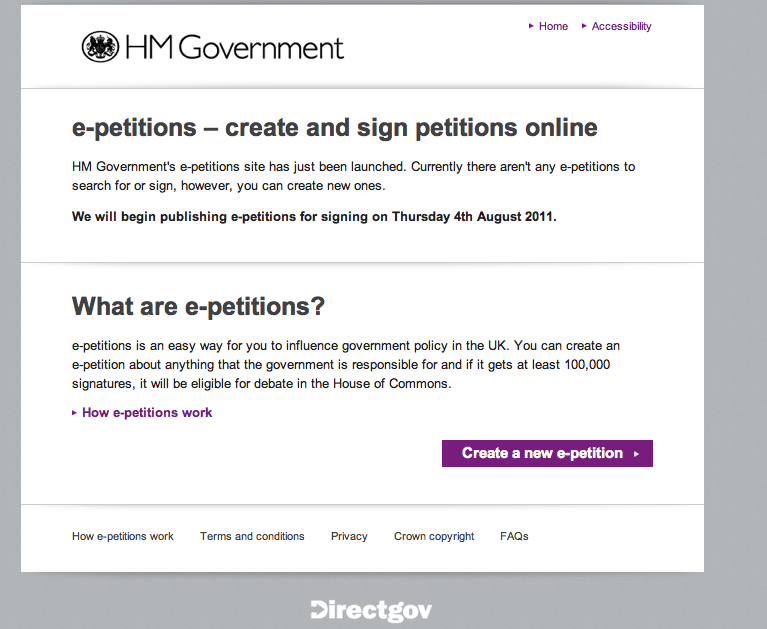 Signatories can also ‘choose to receive email updates from the government about the e-petition’. You petition can be open for up to 12 months. 4. Debate (potentially!) – If you reach the 100,000 target, your petition will be sent to The Office of the Leader of the House of Commons will check it against the terms and conditions for e-petition and the rules of the House of Commons. But Leader of the House, Sir George Young suggested in the media on Friday that ‘parliamentary time is not unlimited and we want the best e-petitions to be given airtime’ which indicates another way of stopping petitions being debated. The last few days have been fascinating for any watcher of UK politics, media or campaigning. Pages and pages have already been written about what’s happened with News of the World and BSkyB. For an advertising boycott of The News of the World (which helped to contribute to its closure). For a public inquiry into the phone hacking. Although they have separate aims lead by different organisations, at times it’s been hard to distinguish from the campaigns, as much of the messaging seems to be ‘Stop Murdoch’. For me at least 5 distinct groupings have emerged, from what I can tell their hasn’t been huge amounts of central coordination, although they’ve clearly fed off each other and sometimes shared campaign tools. It’s interesting to reflect if any of these groups alone would have been able to achieve their campaign aims. 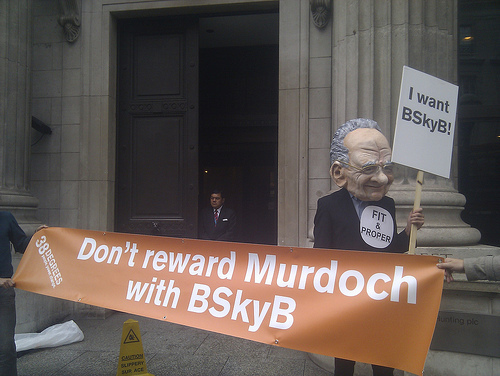 Would, for example the demand to stop News Corporation take full control of BSkyB have happened without the campaign which lead to the boycott of The News of the World (NOTW) being successful? Twitter – Not the site itself, but a number of users who kicked off the idea last Monday about targeting the valuable advertising revenue that was central to the News of the World profitability. Their role has been well chronicled by Rory Cellan-Jones over at the BBC, but it’s also worth reading the account of Melissa Harrison who was one of those who instigated the idea of a boycott on Monday 4th July. It was Harrison and others who developed online tool at http://www.pint.org.uk/notw.html(now taken down) which allowed users to generate a pre-prepared tweet which went something along the lines of ‘“Dear @TheCooperative, will you be reconsidering your advertising spend with #notw given that we now know they hacked Milly Dowler’s phone?”. I’m sure that the presence of this site really help to accelerate the number of tweets that were being sent. We Are Social have done a fascinating breakdown of tweets sent about NOTW last week and calculate that ‘on the 5th and 6th July, over 25% of conversations on Twitter mentioning NOTW keywords also mentioned one of the targeted brands‘. 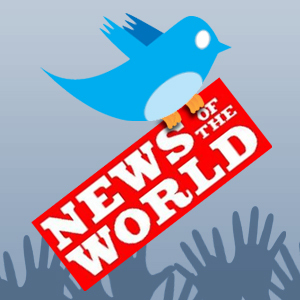 Brands such The Co-operative, Sky, WH Smith and Virgin Media all received over 10,000 tweets about the NOTW advertiser boycott. The Guardian also has a nice visualisation of the way that twitter has been used during the last week. Mumsnet – The site was one the first to promote the pre-prepared tweet tool on pint.org.uk, but was also one of the first to publicly reject money from Rupert Murdoch by ending a campaign that had been promoting Sky (another part of the Murdoch empire) after complaints from users of the site. They were characterised by some as ‘comfortable middle-class mothers of MumsNet sitting down to their fair-trade tea and organic shortbread biscuits‘ but I think their involvement was critical early in the campaign providing momentum and evidence of an appetite for rejecting money from companies associated with Rupert Murdoch. Progressive bloggers – Collaborating together sites like Liberal Conspiracy and Political Scrapbook where quick off the mark in encouraging their readers to get involved in the campaign to potential advertisers that they should boycott (although the numbers directed to the pint.org.uk site are much lower that other sources), but perhaps more importantly they also had the capacity to run the definitive list of advertisers and if they were planning to boycott the paper or not, helping to fuel the media narrative that advertisers were deserting the paper. The press (especially the Guardian) – It was the work of Guardian journalist Nick Davies who brought the story to light, but beyond that it was others at the Guardian, like Roy Greenslade, who encouraged action by providing a list of what people could do on his blog. The Guardian website pushed almost 10,000 people to the pint.org.uk twitter action tool. Certainly the Guardian has lived up to its campaigning reputation this week. Hacked Off – The campaign for a public inquiry into phone hacking was only launched last Wednesday, but has quickly become the group that has been at the centre of mobilising high-profile individuals to get involved in the campaign. Many of those who have are individuals who have been directly affected, included Hugh Grant who appeared on Question Time and the parents of Milly Dowler, who met with Nick Clegg on Tuesday. Supported by the Media Standards Trust, this is perhaps the closest group in the campaign so far that resembles a more traditional NGO approach to campaigning, with more focus on policy processes, media photo calls and meeting with government. 38 Degrees and Avaaz – The online campaigning movement 38 Degrees has been running a campaign for over a year to call for the proposed takeover of BSkyB to be sent to the Competition Commission. As their campaign timeline shows they were well positions to make the most of the opportunity presented by the release of the revelations about Milly Dowler’s phone being hacked to invite people to join this broader campaign about corporate control of the media. It was so successful that the site crashed due to the volume of people trying to take action. Both Avaaz, who ran a petition alongside 38 Degrees which got over 300,000 names to demand a public enquiry into the scandal and 38 Degrees were able to bring their campaigning tools to help individuals to send a message to individual MPs as well as representatives of the government. Their huge e-mails lists (it’s estimated that 38 Degrees has over 750,000 people on its) built on the back of previous campaigns, helped to get the message out and sustaining it over the week, combined with some great ‘pop-up protests’ around Westminster. These groups certainly brought an element of strategic focus to the campaign. What other actors were involved? Was it just online tribes who closed The News of the World?